Two-Faced Toque Free Hat Knitting Pattern by Colorfully Handmade. This simple colorwork design uses a solid color for the main color and a variegated yarn for the contrasting color, producing a beautiful stockinette side and a more textured “wrong side.” This hat is reversible so you can flip it to whichever side you like. 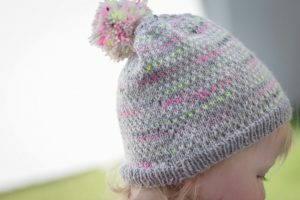 The optional pom-pom is also reversible, and can be attached two different ways.